PHUKET: The driver of a pickup truck was injured this morning when he rear-ended his vehicle into an ice truck parked at the side of Thepkrasattri Rd in Thalang. 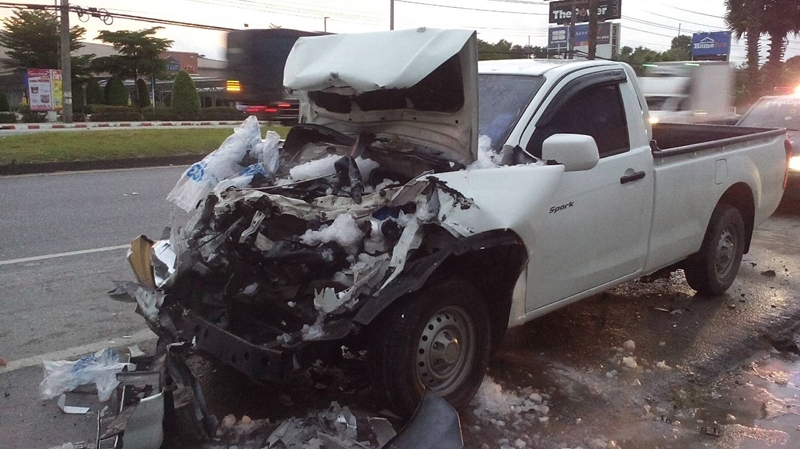 Capt Warawat Sensub of the Thalang Police received a call at 5:30am today (Oct 4) where it was reported that a Phuket-registered white Isuzu pickup truck had smashed into the back of an ice delivery truck near the HomePro store on Thepkrasattri Rd in Thalang. Srisoonthorn Municipality and Kusoldharm rescue workers arrived at the scene to find the driver of the pickup truck, Arkho Nakhachon, 32, injured and stuck inside the vehicle. Rescue workers removed Mr Arkhom from the vehicle and provided him with first aid before taking him to Thalang Hospital. The driver of the ice truck, Teerasak Seree, 37, told police that he was making deliveries in the area. He stopped to make a delivery when the pickup truck smashed into the back of him. Police believe that Mr Arkhom was tired and fell asleep at the wheel. However, they will investigate thoroughly to find the true cause of the incident. How many people sleep when driving, seems to be a high number, on a small island. LOS, Land Of Snoozers .